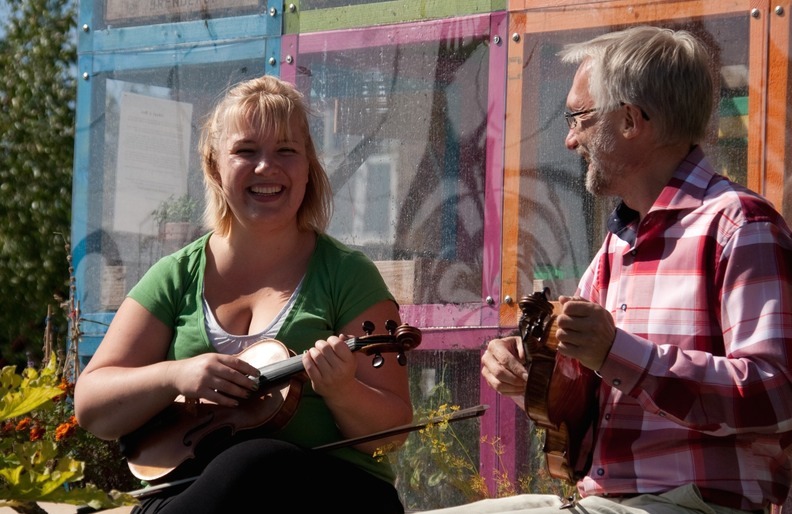 Pia Nygaard (fiddle and vocal) has studied at the Southern Danish Music Conservatory and Acting School. Pia is known for her improvisations in the band Norrøn, and as the woman behind countless solos and violin riffs in the band of irish singer Dennis McLaughlin. Ivan Bjerre Damgård (fiddle, guitar, mandolin and vocal) is known from countless concerts and dancing events with the band Jydsk på Næsen. He was nominated for 4 Danish Music Awards and won the price as folk composer of the year in 2007. Ivan also plays with Ostinat Expressen where modern rythms challenge the Nordic tradition. He was appointed “Rigsspillemand” in 2014.